Lockers are available free of charge to UIC students in the following Lecture Centers: Burnham Hall, Addams Hall, Taft Hall, Stevenson Hall, and Henry Hall. To register, students will need to visit the SCE Building Management office, located on the 1st floor of Student Center East, Monday – Friday from 8:30am – 5:00pm. The donations bins are available to registered student organizations for two consecutive weeks. There are three bins available for use in Student Center East and two in Student Center West. In order to make a reservation, please email rvega1@uic.edu for availability. Once you are approved, please email or drop off three copies to the Building Management office in SCE, SCW or both of an 8 1/2 X 11 sheet with the drive name, sponsoring organization and the dates printed portrait style (or vertical) to put in the bin display. Your group will be responsible for collecting all the donated items by midnight the last day of the drive. The bins will be removed the following day and all items will be donated to charity if not collected. In Student Center East the bins will be located at the East entrance to the Bookstore, by the Halsted Street Station on the second floor and by the Montgomery Ward Lounge towards the dorms. Those are the only locations we host our bins. In Student Center West, the bins will be in front of the Building Management Office on the 1st floor and by the 818 Wolcott entrance. 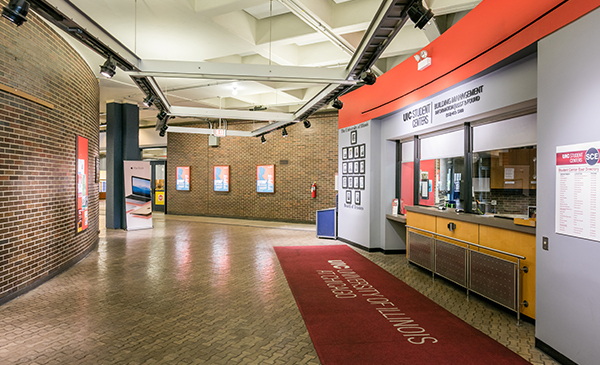 Student Center East, 1st floor, 750 S. Halsted St.
Student Services Building, 1st floor, 1200 W. Harrison St.
Student Center West, 1st floor, 828 S. Wolcott Ave. Articles are kept for 30 days.